“The sea and technological innovation are two crucial aspects, inseparable and fully representative of what the economic and industrial activity of the Basque Country entails. Today, on the occasion of the inauguration of World Maritime Week at BEC, we are talking about fishing, the shipbuilding industry, technologies for generating renewable energy, and about establishing sound and competitive infrastructures to serve the needs of both fishing and industrial economic activity, as well as areas for leisure and enjoyment, taking into account our network of marinas. This is how Arantxa Tapia, Minister for Economic Development and Infrastructures of the Basque Government addressed those attending the plenary session of the event. Arantxa also pointed out that “from the point of view of INFRASTRUCTURES, our geographic positioning requires us to be prepared to provide the most cutting-edge services. The ports represent key transport hubs for commercial traffic, fishing vessels and leisure craft. This is why they need to remain attentive to new demands, ready to respond effectively to them: digitalisation or the addition of technology 4.0 to the ports is now a reality”. “With this continuous improvement, stated the Basque Minister during her speech, we are strengthening our commitment to our multimodal transport, and to port and railway connections. Our goal is to improve the connection between land and sea activity by means of the railway”. 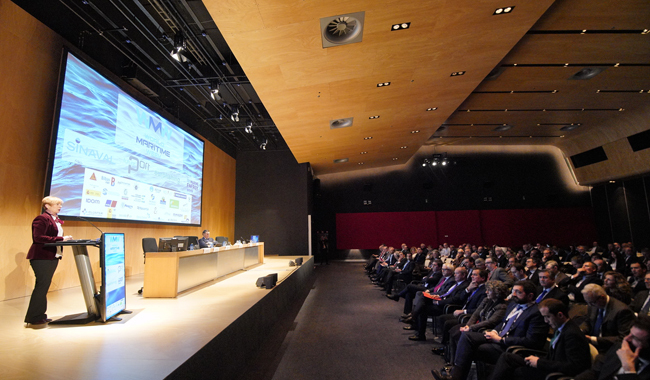 The plenary session of the World Maritime Week was attended by the chairman of the CEOE, Antonio Garamendi, Philippe Louis-Dreyfus – chairman of the Louis-Dreyfus Group, Alejandro Aznar, Chairman of the Spanish Maritime Cluster and of the Ibaizabal Group, Juan Riva, Chairman of the Suardiaz Group, Benito Núñez, Directorate General for Merchant Shipping (DGMM) ,Patrick Verhoeven , Managing Director of the International Association of Ports and Harbours “IAPH”, Javier Garat , General Secretary of CEPESCA and Xabier Viteri , Director of Renewable Energy Business, Iberdrola Group, “Iberdrola”.